Much has been made of Pádraig Timoney's dexterous avoidance of a signature style. In searching for a foothold from which to tackle FONTWELL HELIX FEELY, Timoney's current solo exhibition at Raven Row, it quickly becomes apparent that this recurring emphasis on the artist's variegated output is not without reason: for to begin with an analysis of any individual work risks drawing conclusions that do not relate to the whole. The facts of the exhibition are these: there is an emphasis on painting, with occasional lapses into photography or simple assemblage. Timoney isn't interested in the grand gesture; rather, each of his works is a small cut or jab directed at established methods of image making and ways of seeing. The impetus for individual works is often diaristic or opportunistic. And their maker doesn't give a fig for art world pigeonholing, market categories or display conventions. 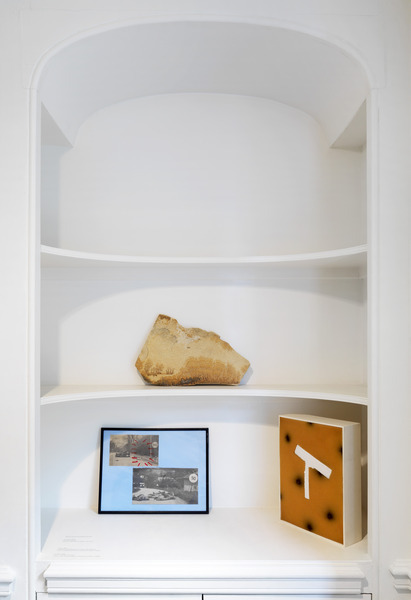 In fact Timoney breaks some rules that are so ingrained I had never really thought of them as rules in the first place: mounting a fragile work so that it juts out into a doorway, for instance. Mentally keeping up with this sort of thing can really take it out on you, and by the third floor of the gallery I was starting to feel anxious and a little paranoid. Timoney's work has a cumulative effect: although you cannot point to any individual element that is confronting or confusing—indeed many of his works seem at first like one-liners, or simple formal experiments—en masse they can be claustrophobic. 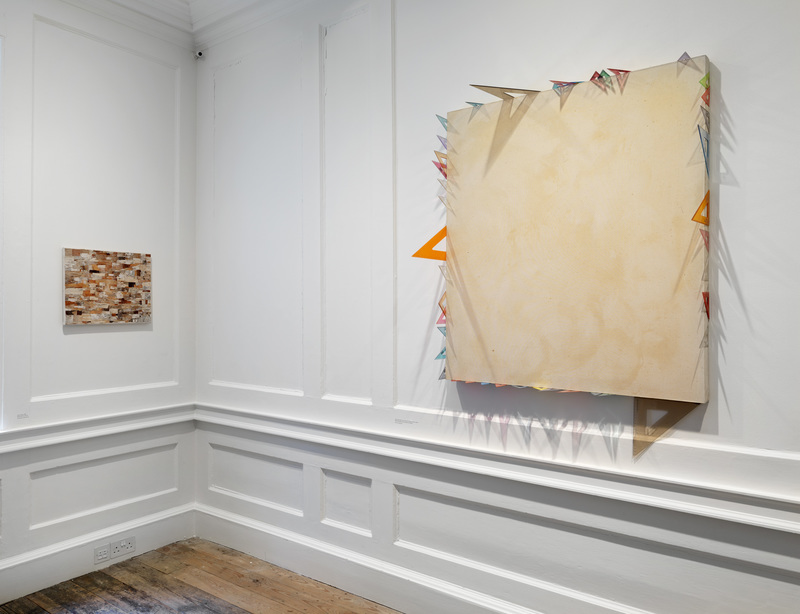 Pádraig Timoney, Clockwise from left: Evens, 1994; AyeStone, 2010; Untitled, 1996; Courtesy Laure Genillard and Raucci/Santamaria Gallery; Anton Kern Gallery, New York; Naples; The artist and Raucci/Santamaria Gallery, Naples / Photograph by Marcus J. Leith. This is because it is easy to become overwhelmed by the pressure of needing to constantly shift your worldview, slightly, to apprehend each and every work. For example, the show includes: a collage made of overlapping rectangles of papery birch wood; a stain painting that professes to contain dragon's blood; a photograph of water jetting from a faucet onto a spoon; a series of stretcher frames covered with polyester fleece and sprayed with sheep marking paint; and a still life painting of a slice of pumpkin endowed with the wonderfully lucid title Imagine this pumpkin is a superhuge concrete boat that has crashed into a small volcanic island in the bay of Naples, knocking off the top of it and causing an eruption (2005). The paintings that form the bulk of the show are vibrant and jarring, with a guts-and-glory approach to materials. Tinned Tomatoes (2003) is characterised by gelatinous smears of saucy paint, while elsewhere Timoney has applied corrosive photographic developer or lashings of rabbit-skin glue over oils-on-canvas. His processes are almost alchemical, or perhaps akin to a strange system of natural selection: a pitting of elements one against the other; a testing of durability, of whether a property can be retained, or whether the introduced agent will irrevocably alter or corrupt the base. Pádraig Timoney, FriedSalt,1997; Courtesy The artist and Raucci/Santamaria Gallery, Naples / Photograph by Marcus J. Leith. Many works contain a surplus of meaning or form. The Great Supper (2012) is a painting of a dreary suburban house with an over-abundance of windows, each displaying the same bowl of pink flowers and vague interior view. Other works are dryly, abruptly humorous: Bison Horizon (2009) comprises a small teal bison statuette placed in the corner of a box frame, propping upon its shoulder one edge of a large mounted photograph depicting a desert landscape, a minuscule herd of animals just visible near the horizon line. 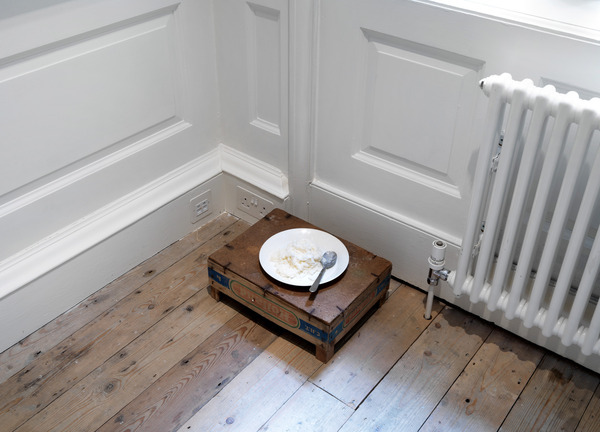 And Fried Salt (1997) is just that: a portion of fried salt, served on a plate, on an upturned box, in a corner. Timoney is consistent in his inconsistency. Eclecticism and experimentation are his only true unifying principles. By summoning this motley league of misfit works under the banner of a solo show, he forces us to acknowledge that we stand on shifting sands, both inside and beyond the gallery: fixed perspective and linear progression are mere illusions. For Timoney, restlessness and contradiction are the qualities of lived experience, and thus the preferred means through which to conduct his scattered yet sustained investigation into the minor details of daily life—his questioning of thought and matter, and the infinite ways in which they can be fitted together or pulled apart. By creating small gaps here and there, Timoney destabilises larger things.